If resistors are connected end to end such that same current flows in each resistor but different potential difference is observed across then such combination is called series combination. 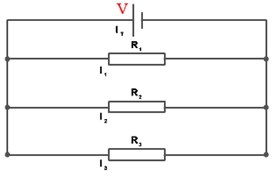 Let, R1, R2 and R3be the three resistors connected in series to a battery of volt V. Same current I flows in each resistors while V1, V2 and V3potential drops are observed across R1, R2 and R3respectively. If one of the ends of resistors are connected to a common point and the rest of the ends to another common point such that same potential difference is observed across each resistor but different current in each resistor than such combination is called parallel combination. The equivalent resistance is smaller than the smallest individual resistors connected in parallel. i. 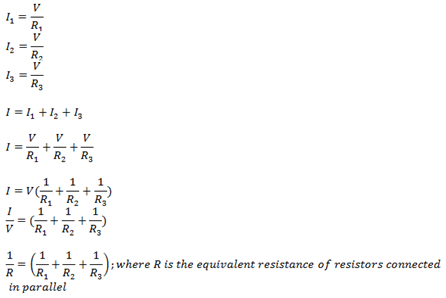 If identical resistors each of resistance R are connected in series than the equivalent resistance is “Req = nR” so we get maximum resistance from the given resistors when we connect them in series. v. The ratio of maximum resistance to the minimum resistance obtained by connecting n identical resistors in series and in parallel is n2.